"A useful, pragmatic, how-to-do-it book. The value proposition of a corporate investment has always been about reducing costs or increasing revenue. Messner shows companies how to ensure that projects are really doing that. It is this process of leveraging project expenditure which makes organisations successful." 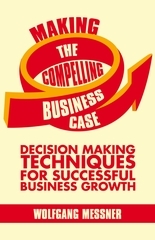 "This superb text provides a powerful ensemble of formula, techniques, and guidelines for business case success. Comprehensive and complete, it is the long-thought link between financial business case mathematics and stakeholder management." "It is amazing how much the quality of business cases varies in both preparation and subsequent execution. Messner brings the voice of experience resulting in a clear, comprehensive, and up-to date guide on building solid business cases. You should have it on your bookshelf and consult it frequently." "Today's information technology landscape is increasingly multifaceted and at the same time increasingly critical to business success. Its complex projects come with significant costs and are not easy to weigh up against each other. Funds are restricted and the company's financial management keeps on challenging project justifications. A business case is the one and only instrument for the project originator to present all necessary facts: costs, benefits, risks, and strategic options. But it does not end here - even the best business case with the best net present value still needs to be presented to senior management for the ultimate go-decision. Messner has created a thorough and systematic book; it gives you new inspiration and guidance to champion your projects professionally and successfully. I personally use these concepts and techniques in my position as CIO." "This book very clearly brings out careful use of both quantitative analysis and several qualitative factors that are essential for key investment decisions. Drawing on a wealth of case studies and examples, Messner provides fresh ideas, profound advice, and useful structures that can be quickly applied in today's fast-moving business environment, where succinct and reliable information is the key to success." "Messner took the concept of investments and the creation of business cases to a new level. His new book blends his deep hands-on project management and investment experience in emerging markets like India with an excellent understanding of modern investment theory. He emphasizes the need to consider risk and uncertainty in investment decisions; the frameworks and methods explained are most valuable for companies investing into business-growth areas and new markets. A must-read business book!" "Making the Compelling Business Case belongs at the top of the reading list of account managers who want to turn selling around and become a trusted consultant. Customers do not buy from you because your product offers great features; they choose the offer with the best value proposition to their business as well as on a personal level. A business case in sales is a way of communicating this message and helping clients get what they need and want." "Leaders thrive on results. This excellent book should be of great interest to all executives who need to have continued success with their investment decisions. The approach described not only aligns organisations to take the right decisions, but to sustain delivered benefits over time." "Can we really end the litany of challenged projects? This wonderful book is full of fresh ideas and describes in simple terms how to analyse and evaluate investment propositions - decisions we have to face each day in running and growing our business." "Messner's new book Making the Compelling Business Case gives a very insightful look into the corporate decision making process in today's competitive business environment. Being comprehensive and complete, it helps to remove the doom and gloom of the business case process." "This is a great book that should be on the bookshelf of every senior executive. It is packed with real examples, concepts, frameworks, and techniques for preparing and evaluating business cases. The book is easy to read, and the figures and diagrams add to the flow of the text. Messner has distilled his academic and business experience into a fine contribution." "Messner's comprehensive approach to investment decisions will help managers assess the financial aspects more carefully while preparing business cases. This step-by-step guide to comprehensively evaluate alternatives will help managers think through their plans before trying to persuade their CxOs who are always concerned about returns on their capital spending. In today's challenging business environment, persuasive business cases are even more relevant and Messner’s book is an extremely useful guide for corporate managers."